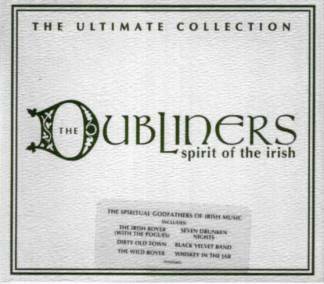 Every year seems to bring another Dubliners’ compilation and here we go again with this new one claiming to be ‘The Ultimate Collection’ and heavily bolstered by a TV advertising campaign to boot. ‘Ultimate’, of course, can mean ‘final’, but it’s hard to imagine that songs such as Whiskey in the Jar and Seven Drunken Nights won’t be unleashed yet again in future compilations. For those who have so far managed to lead sheltered lives, The Dubliners have been purveying their brand of raucous, rollicking good-time balladeering and traditional musicianship for the last forty years, occasionally infiltrating the charts and never really wavering from the path they first laid down in Dublin’s O’Donoghue’s bar in the early 1960s. Two of the band’s singers (Luke Kelly and Ciarán Bourke) died young yet, despite other more minor personnel changes, The Dubliners remain prominent figures on Ireland’s musical landscape. Anyone fond of the band will already have most or all of the twenty songs and tunes on this album and, for those tempted by its contents, it does supply a reasonable introduction, although Castle Communications’ The Definitive Transatlantic Collection (collating some of the best of their 1960s recordings) is a far more preferable alternative. Be warned, however, if you’re tempted by Spirit of the Irish, that the sloppily written liner notes do the band a major disservice. The track listings provide no details of the relevant personnel (a major lapse considering the difference in vocal styles between the group’s various singers) and, although their early recording career is recounted in reasonable detail, their output since 1987 is noted with desultory brevity. Band members are not identified in any of the photographs and the liner notes are riddled with factual and typographical errors and just plain old-fashioned cant, highlighted by the utterly meaningless assertion that The Dubliners are “Irish Music’s Spiritual Godfathers”. For more information about Sanctuary Records visit www.sanctuaryrecordsgroup.co.uk.